Myeloproliferative neoplasms (MPN) are clonal disorders characterized by hyperproliferation of blood cells. Previous studies have identified that the initiation and progression of MPN are associated with recurrent somatic mutations. To date, these genomic alterations have served as targets and led to the advancement of therapeutic strategies against MPN. However, with the exception of hematopoietic stem cell transplantation, current treatment strategies are not curative and fail to achieve long-term remission. Therefore, there is a need to develop more effective strategies for the treatment of MPN. To this end, Cansu is exploring novel targeted-immunotherapy approaches for MPN treatment. We hypothesize that MPN-specific genomic alterations may give rise to shared neoantigens that can elicit antitumor immune responses. Therefore, we are investigating the immunogenicity and immunomodulatory effects of such mutations in MPN patients. 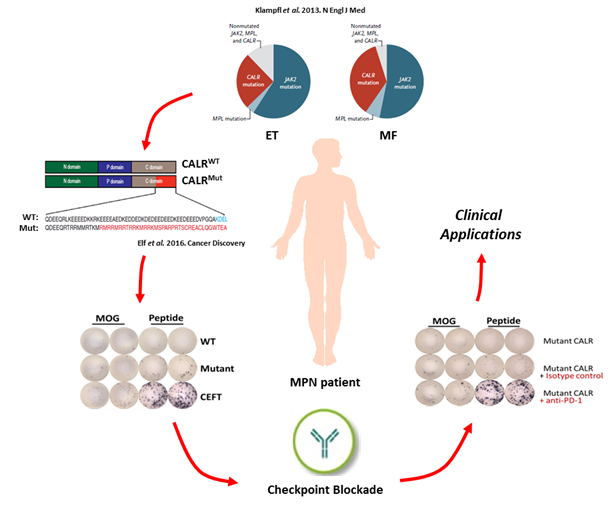 Our results will identify MPN-specific neoantigens and will provide foundation for the development of immunotherapies targeting MPN.